At the end of every year, we like to take sales data and crunch the numbers to determine trends for the past few years. I used data from Quincy, IL, as this is the largest residential market that we work in, and where many people from the surrounding areas travel for employment, entertainment, shopping, etc. Our sales data includes single family detached residences and condominium units. It does not include transactions where more than one living unit was being sold, except in the rare cases of a large home with an accessory unit. This data was then grouped by year and sorted, and the data was analyzed and used to create the graphs below and draw the following conclusions. Sales volume increased somewhat from 2015, and in general appears to be slowly increasing. Regarding residential sales price, the market appeared to strengthen significantly in 2015, with the average price increasing substantially when compared to 2013 and 2014. 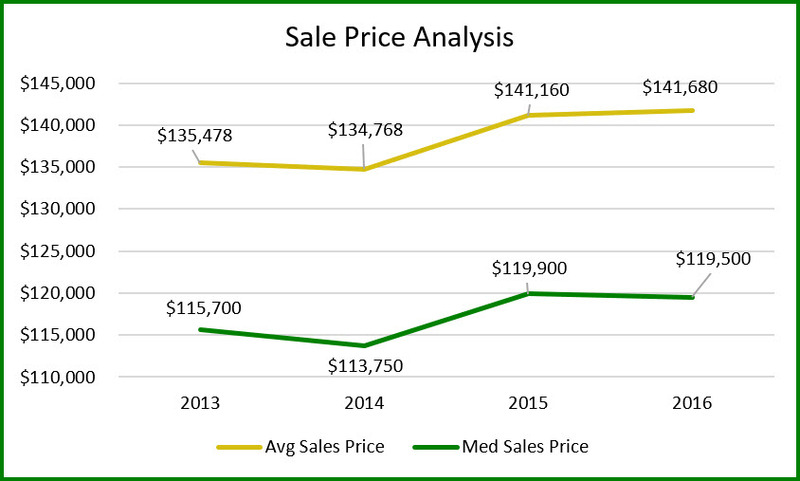 However, during 2016, both average and median sales prices of homes in Quincy leveled off, with the average price increasing slightly, but the median price decreasing somewhat. This is not entirely unexpected, as interest rates increased during 2016, which tends to make homes less affordable. The median sale price tends to be a better measure of central tendency, as it is less prone to fluctuations from sales in extreme high and low price ranges. In 2015, the number of days properties sat on the market prior to selling continued to decline. Days on Market can be influenced by several factors, such as unreasonable pricing (both too high and too low), a lack of marketing/advertising by the listing broker, or any number of other reasons. 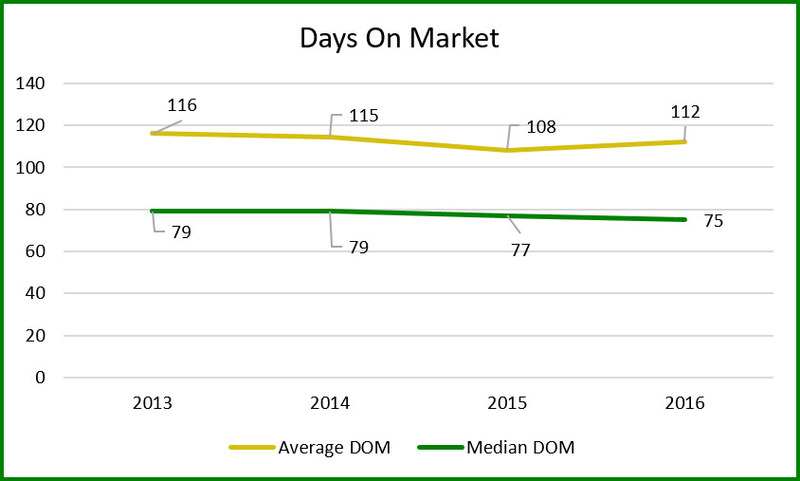 In 2016, median DOM continued to decline, while average DOM inched higher, although it can tend to give too much weight to properties that are improperly marketed and sit on the market. I anticipate interest rates will continue to creep up during 2017, which may put a damper on any significant price increases, although it is a positive sign that the market does appear to have held steady during the past year, despite the previous rate increases. I view this as a sign that demand in the market is strong enough to sustain prices despite the increased cost of capital.